Transit, bicycling, and pedestrian programs will be increasingly important in order to meet the country’s future transportation needs. That’s one conclusion that can be drawn from a new report by the U.S. Department of Transportation (DOT) called Beyond Traffic. The report, currently still in draft form, is the Obama administration’s 30-year framework of our transportation challenges in the U.S. The picture it paints isn’t pretty. 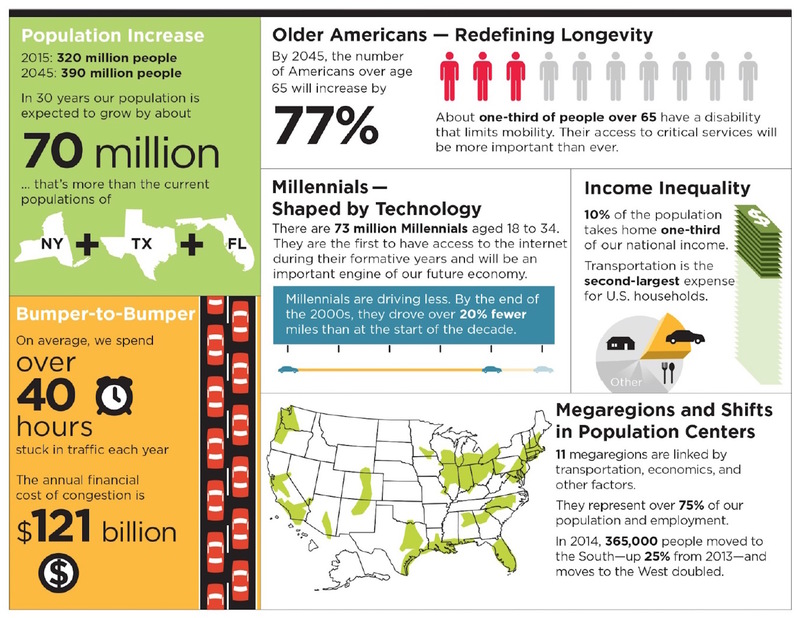 Crumbling infrastructure, coupled with big population increases in the south and west, will result in a transportation system in the coming decades unable to support the demands placed upon it. Population changes will make traditional automobile-based transit unsustainable in the U.S. To move our future populations, and keep our economy humming, many cities will need to embrace public transit in a major way. Furthermore, bicycle and pedestrian programs, perhaps the least understood and respected of transit modes, will be of increasing importance. In other words, the future of the U.S. looks remarkably similar to what’s being accomplished today in places like Manhattan, Portland, San Francisco, and Arlington County, Virginia. The DOT report, at over 300 pages, is a lot to wade through. It charts the U.S.’s bumpy road away from car dependence towards a national model of transit-oriented development. The report should be helpful for those who are serious about achieving sustainable, long-term mobility will have to look more closely at active transportation and transit-oriented development, even if they’ve been against those ideas before. the advent of so-called mega regions, which will house 75 percent of our housing and employment in the coming decades. Rather than be prescriptive in nature, Transportation Secretary Anthony Foxx has said that the DOT report is intended instead to help facilitate a dialogue about the future (interested parties can comment at #BeyondTraffic and at a website set up by DOT, as noted in the video above). This comes at a time when Congress is attempting to determine how to fund the trillions of dollars needed – according to an American Society of Civil Engineers report – to fund critical infrastructure repairs by 2020. What’s clear from the report is that an emphasis on active transportation and transit will need to be a bigger picture for most jurisdictions than they have to date.